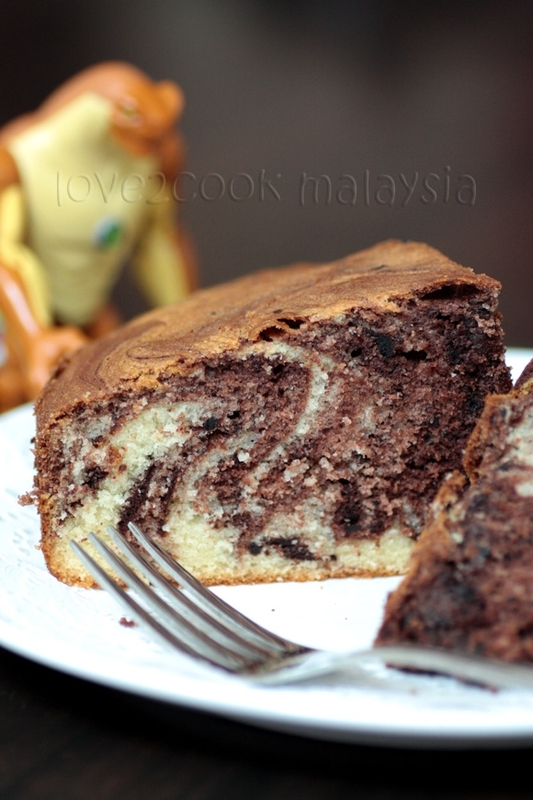 My son asked for a chocolate cake, but I so wanted to bake this marble cake after seeing Namitha's. Somehow managed to convince him that I gonna bake a cake with lots of chocolate flavours in it. Not to disappoint him, I added cocoa in half of the batter. Please don't ask me where the marble disappeared...hahaha! Truly soft and delicious cake, do try it...no regrets. 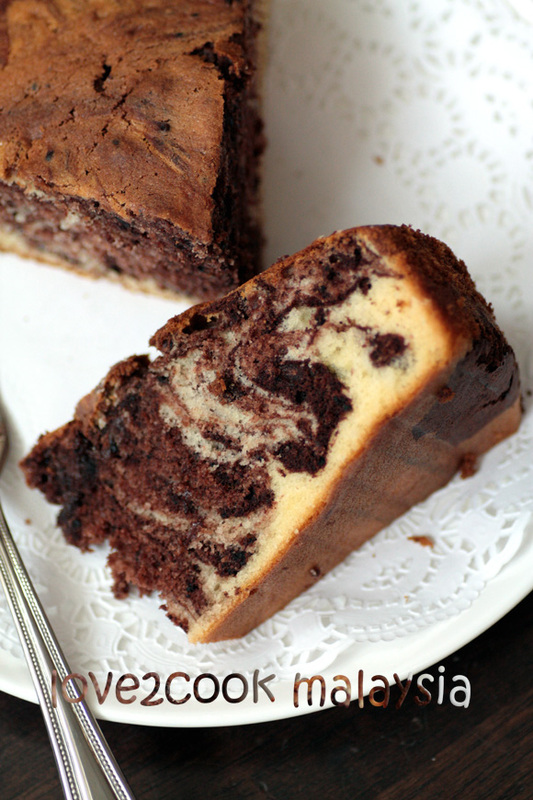 VANILLA & CHOCOLATE MARBLE CAKE adapted from Martha Stewart and Archana Thomas. In a bowl, whisk together cake flour, baking powder and salt. Beat butter and sugar until light and fluffy. Add eggs, one at a time, beat until well combined. Add vanilla. Add flour mixture in 2 batches, alternating with buttermilk. Beat over low speed. Set aside 1/4 of the batter and add cocoa, stir until well combined. Spoon batters into a cake tin in 2 layers, alternating spoonfuls of vanilla and chocolate to simulate a checkerboard. To create marbling, run a table knife (or wooden skewer) through the batters in a swirling motion. Bake about 40 to 50 minutes. Transfer tin onto a wired rack for 10 minutes. Release cake from tin and cool completely. This cake can be kept in an airtight container at room temperature up to 3 days. Hai love,nampak sedap tu.Akak belum b-fast ni.Nak gi buat kopi dan tunggu kek ni sampai kat dapur akak. whoa..nmpk sedap n gebuss tu..bak la sepotong nak rase..
wowww!~ sedapnye nampak..menitik╡ dah air liur ni..ekekeke..seslice tu utk i kan kan kan/? 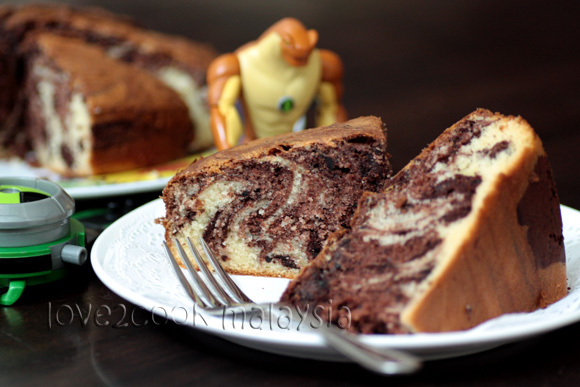 Marble cake looks marvellous and highly addictive.. 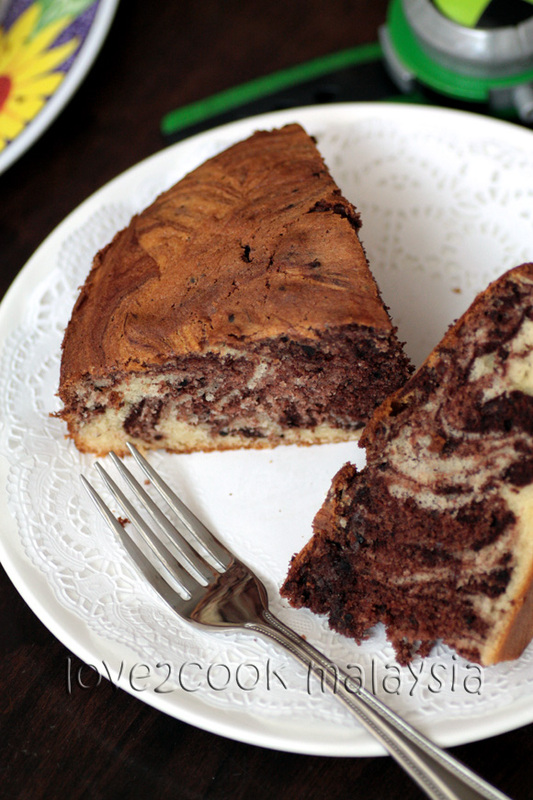 I still can see this is certainly a beautiful marble cake. By adding butter milk, I'm sure this cake taste even better and stay moist. A treat to the eyes and also to the palate. yumm..
hope the Humungousaur did not attack on the whole cake. Looks so delicious. I am surprised you got these pics. wah!! 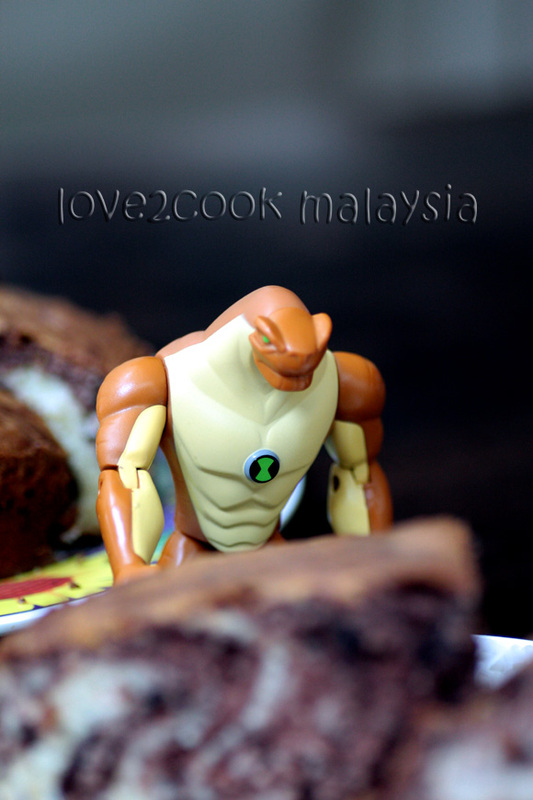 !.u made me drool lah love..nice cake you have there! !..rasa macam nak ngap seketul..
Hi Love..nampak sedap kek marble tue!! Looks moist and yummy dear! Looks so lovely.....just can't wait to grab one piece...very nice recipe. Hey I just tried this recipe and it turned out really well. Thank you for sharing!